Starting with Surface Pro 4, Microsoft has created their own Surface UEFI for using with newer devices. 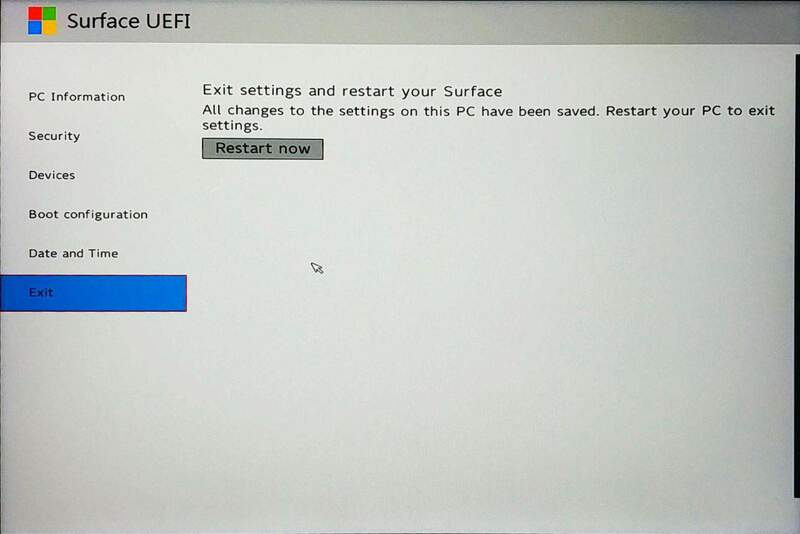 This new Surface UEFI is currently used on newer devices including Surface Go, Surface Book, and Surface Studio. Compared to other Surface models, Surface Go has a slightly new design interface including a different on-screen keyboard. In this article, we will walk you through how to access and configure the Surface Go UEFI settings. How to access Surface Go UEFI settings? 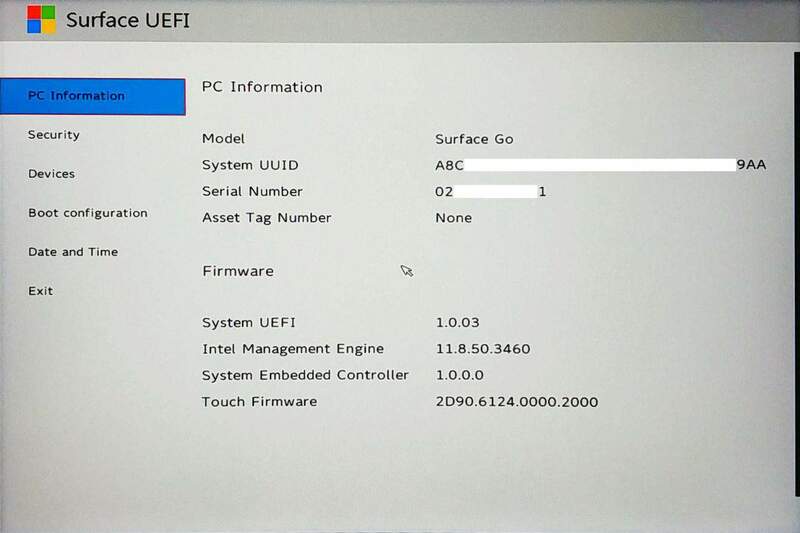 How to check your Surface Go device Information via UEFI settings? How to Change System Boot Order on Surface Go? 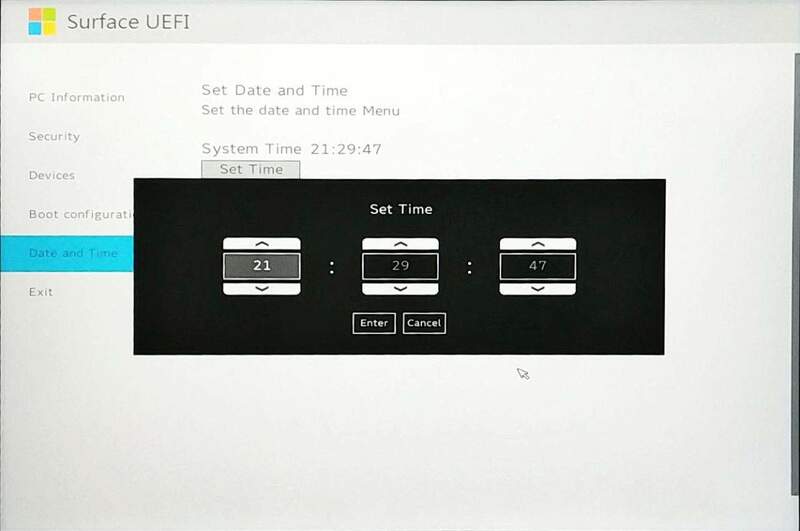 How to Manage Device Components on Surface Go UEFI Settings? 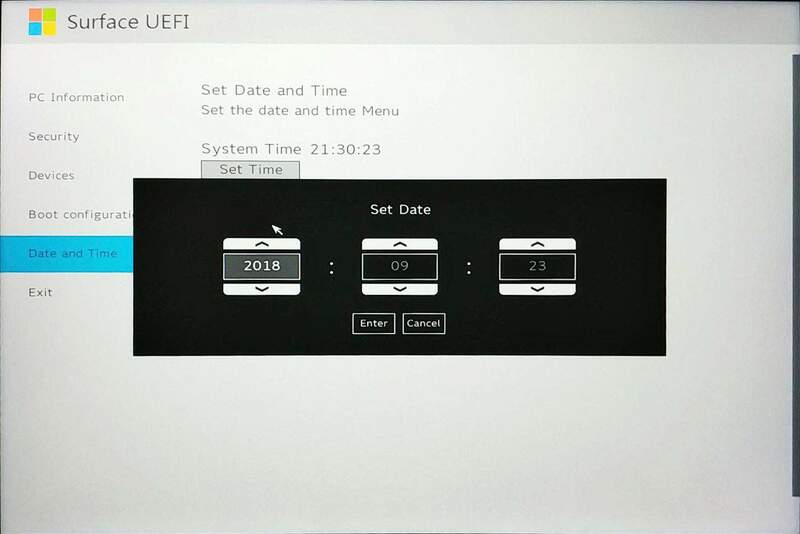 How to change your Surface Go Date and Time via Surface UEFI? 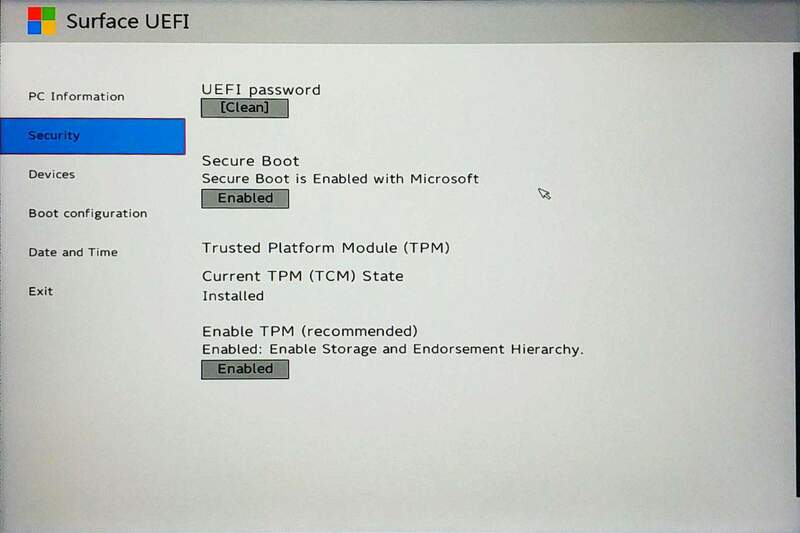 How to Protect UEFI settings with a password on Surface Go? What is the Trusted Platform Module (TPM)? 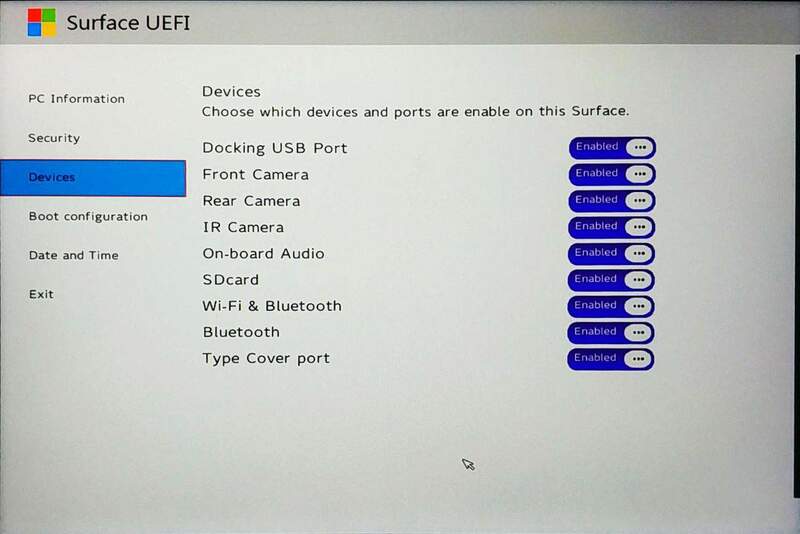 1 How to access Surface Go UEFI settings? By default, every change you made will automatically be saved. When you restart your Surface, all settings will take effect. To do so. 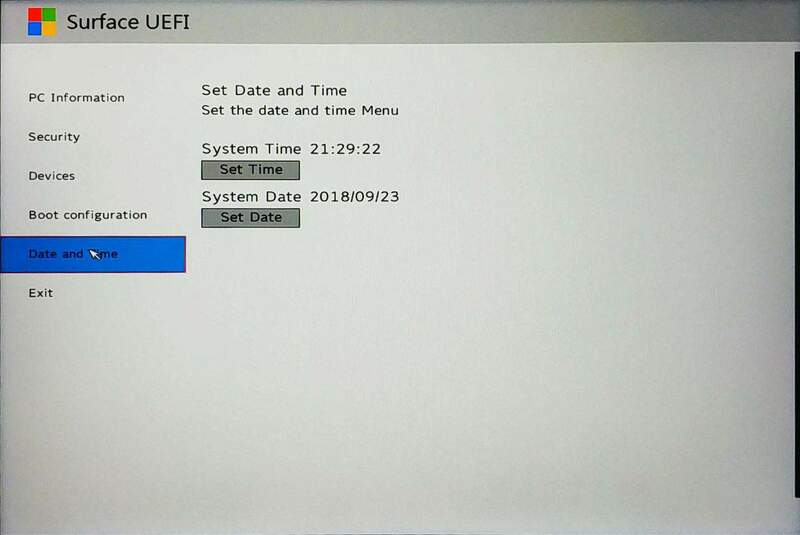 In UEFI settings menu, select Exit. 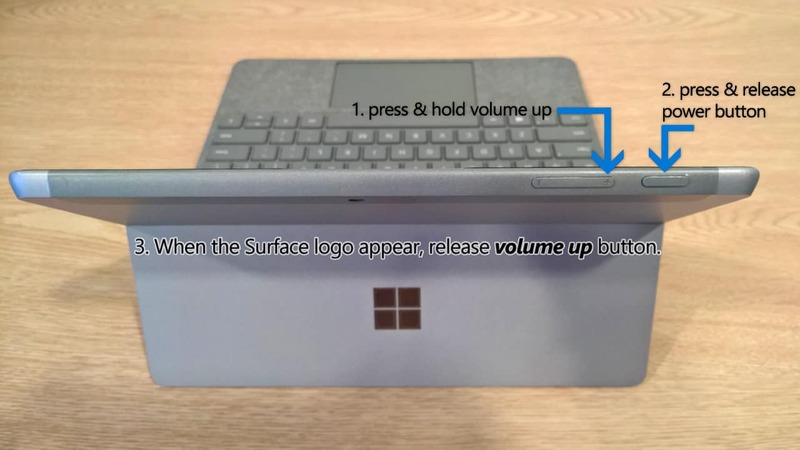 It will save all the settings you have changes and restart your Surface. You also have the option to discard all changes as well by using your Surface Type Cover or external keyboard. To do so. On the keyboard press the ESC key. 2 How to check your Surface Go device Information via UEFI settings? 3 How to Change System Boot Order on Surface Go? 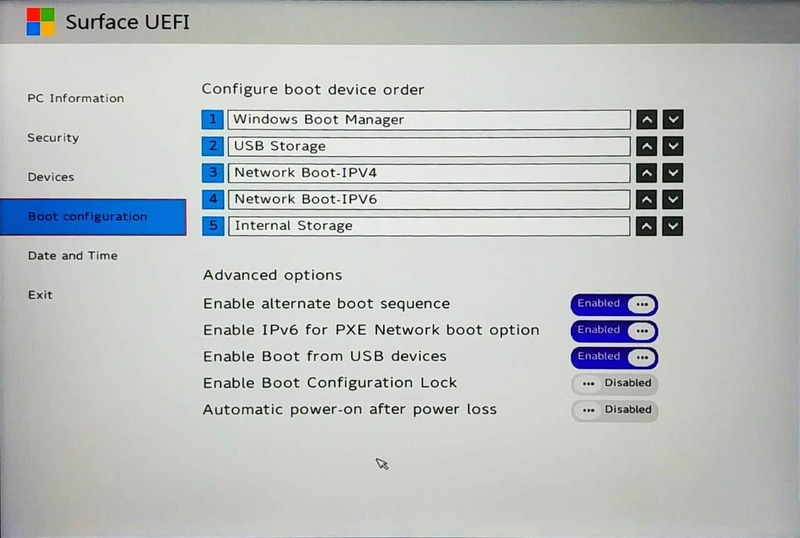 Rearrange boot order by clicking the up/down arrow button on any boot option available on the list. 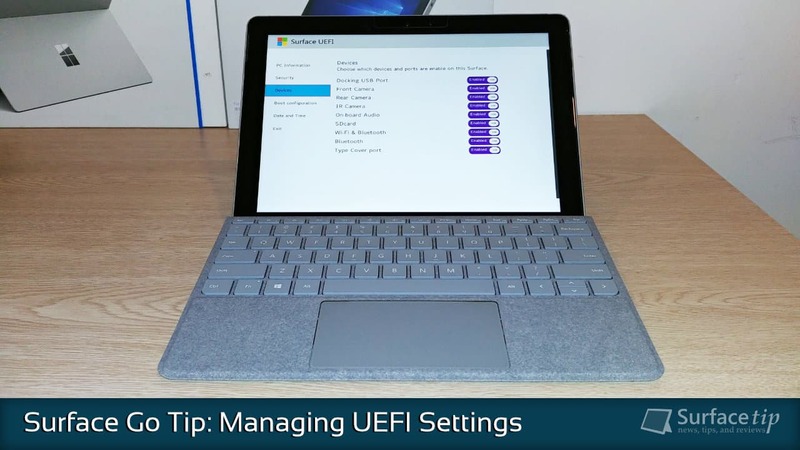 4 How to Manage Device Components on Surface Go UEFI Settings? Docking USB Port – enable/disable the ability to use USB ports on the connected dock. IR Camera – enable/disable the Infrared camera used for Windows Hello feature. On-board Audio – enable/disable internal audio or speakers. SDcard – enable/disable microSD slot. Wi-Fi & Bluetooth– enable/disable both Wi-Fi and Bluetooth. Bluetooth – enable/disable the internal Bluetooth only. Type Cover port – enable/disable the Surface Go type cover. 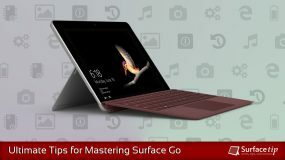 5 How to change your Surface Go Date and Time via Surface UEFI? To set a new time, click Set Time. To set a new date, click Set Date. 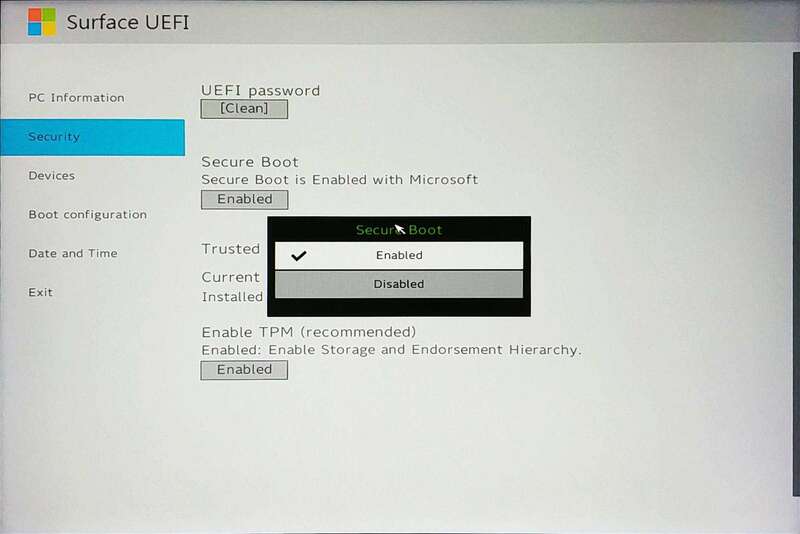 6 How to Protect UEFI settings with a password on Surface Go? 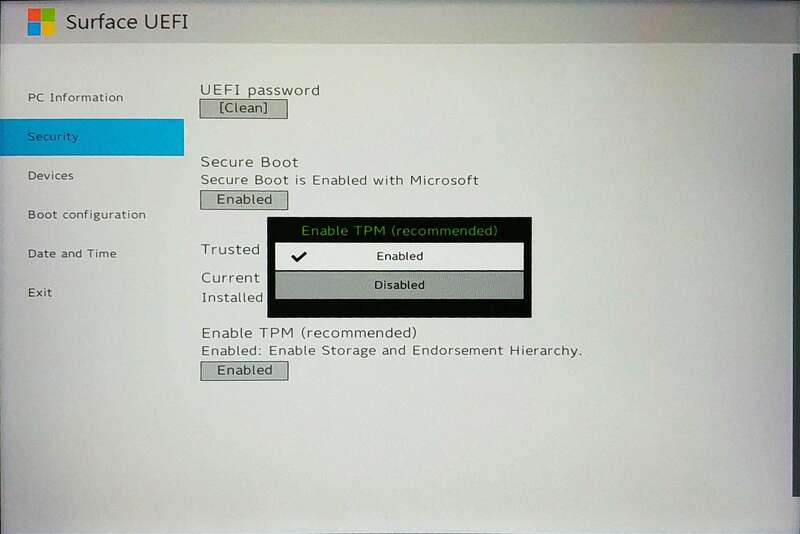 In UEFI settings menu, select Security. 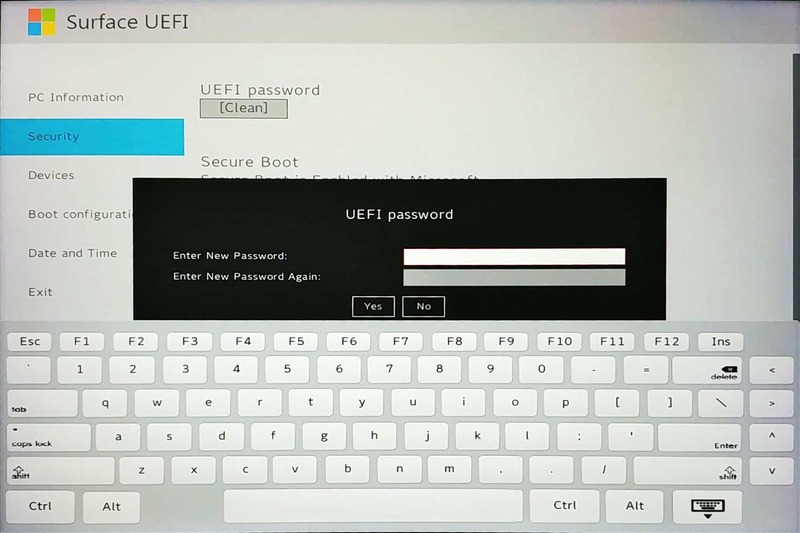 Under UEFI password, click [Clean] button to create a UEFI password. 7 What is the Trusted Platform Module (TPM)? The TPM technology is a requirement of BitLocker disk encryption. The TPM helps you to encrypt/decrypt the entire disk without required your complex long passphrases. It means that the encryption key and decryption key are stored within the TPM chip. So your encrypted disks can’t be accessed on other devices. 8 What is Secure Boot Control? 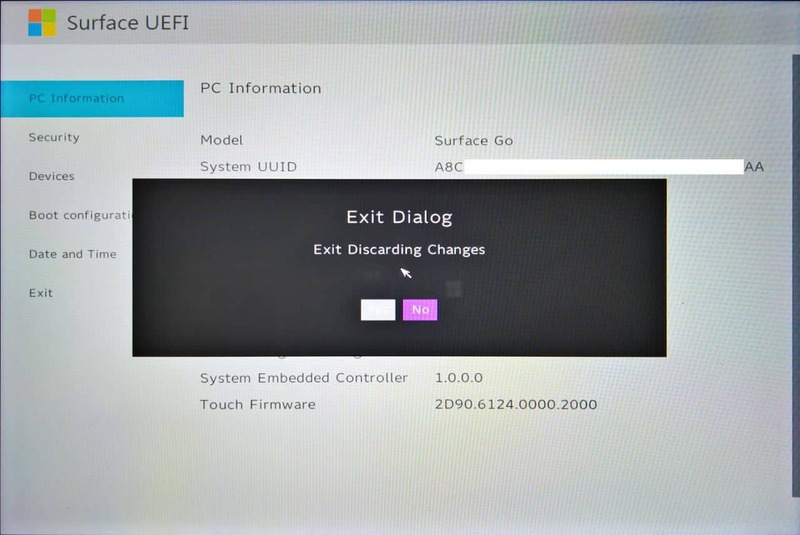 We appreciate hearing your thoughts, questions, and ideas about “How to configure Surface Go UEFI/BIOS settings”. Please post respectful comments and on topic. We will be replying back to you as soon as possible. Share your idea about "How to configure Surface Go UEFI/BIOS settings".